We went to school together and were in the same circle of friends since we were sixteen. After losing touch for a while, we caught up five years ago and hit it off really well. After two months of dating, I moved to Indiana, USA for university and after my six months studying there we moved in together when I got back to Australia. Fast track to now and we’re engaged, have a three year old German Shepherd named Kaliber, have bought a house together, and have moved to a country town for Andrew’s work and a bit of an adventure. Andrew proposed when we were holidaying in Bali in December 2016. We were the only ones walking along this particular private beach in Nusa Dua. When I turned around to head back, Andrew was on one knee and he proposed. I was very surprised and kept saying “no way” before I said a resounding yes! It was great because it was just the two of us and we had about five days together before we headed back home to Australia where we told everyone. It was great to have some time just the two of us to really enjoy the moment before we told our family and friends. The Dress! 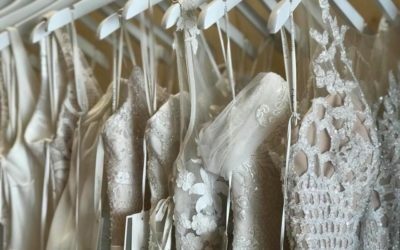 Describe your experience finding the dress .. How did you decide on the one? I really wanted to wear a full skirt and fine white knit. This was the first bridal store I had been in and I came alone so I could find exactly what I wanted without feeling influenced by other people. Katherine showed me a few different options and as soon as put the skirt on I knew it was the one. We paired it with a fine-knit silk wrap top and a (very) long double veil. We made a few adjustments to the length of the skirt, bustiere (which I wore underneath) and the veil, as well as where the top sat around my décolletage. We then added a Mongolian-fur (animal-friendly) collar that I could wear to stay warm at the top of the mountain. 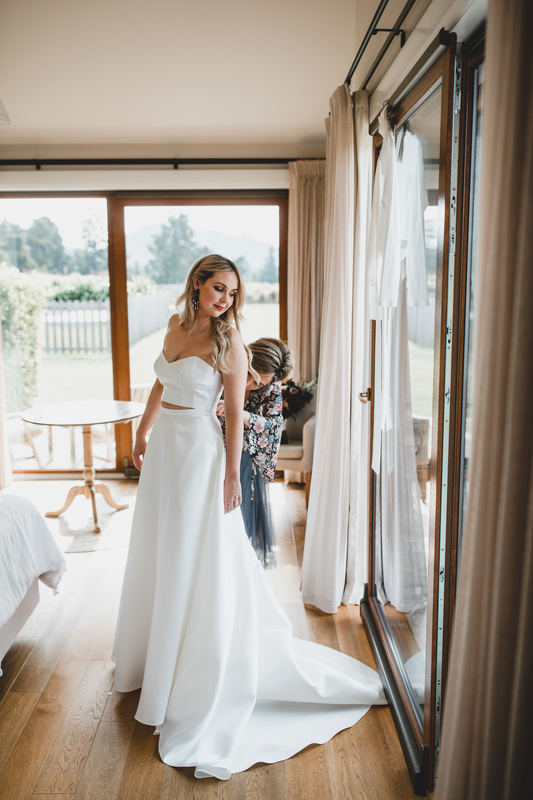 I felt really comfortable and looked-after throughout the entire process and it was such a lovely touch to have Liz take me through all of my fittings. The team also packed my garments into a carry-on suitcase for me so it would travel safely. 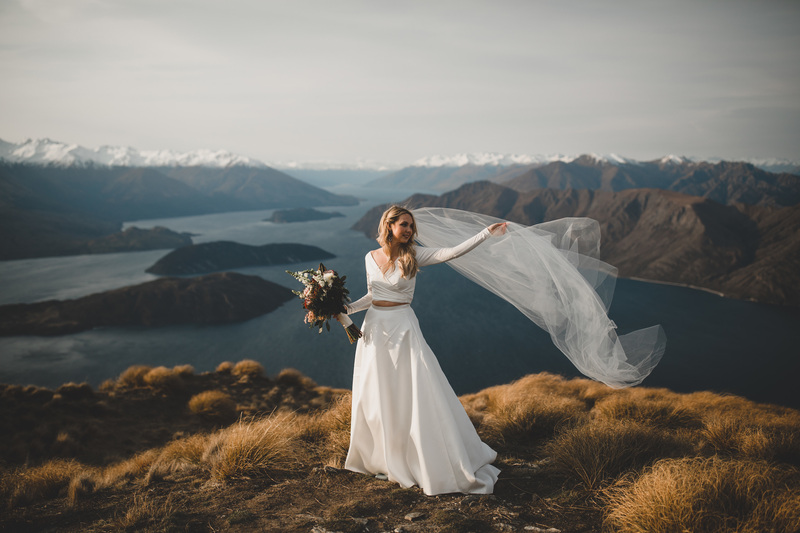 We decided to elope at the top of a mountain in New Zealand. 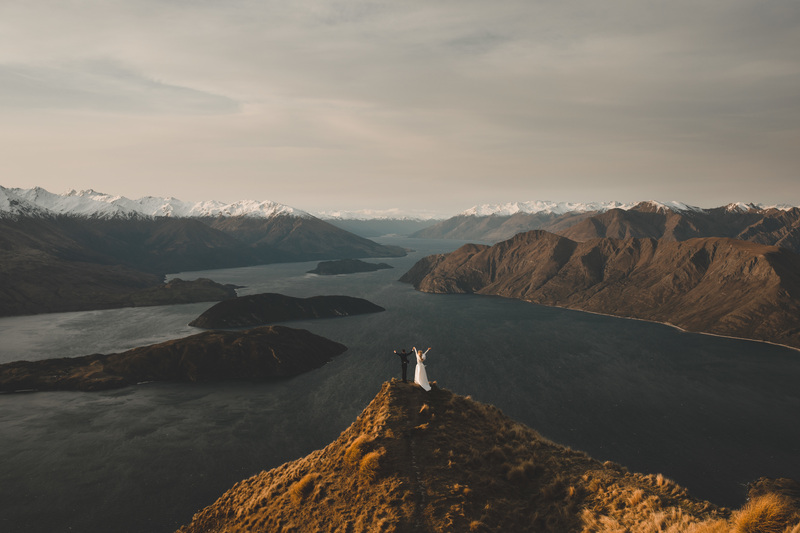 We flew by helicopter to Coromandel Peak where we were married overlooking the Southern Alps and Lake Wanaka. We were really fortunate with the weather and had a magnificent sunset up there. It was beyond incredible! When we were reading the vows that we wrote to each other. 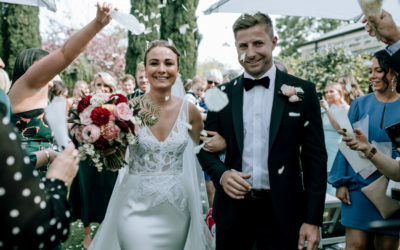 It was a really personal and private moment and we’re so grateful that we were able to enjoy every moment of the ceremony and the day, without having to worry about keeping other people happy. The day was completely about us and the life we want together, it was really special. Hens Day! Please tell us all about it! 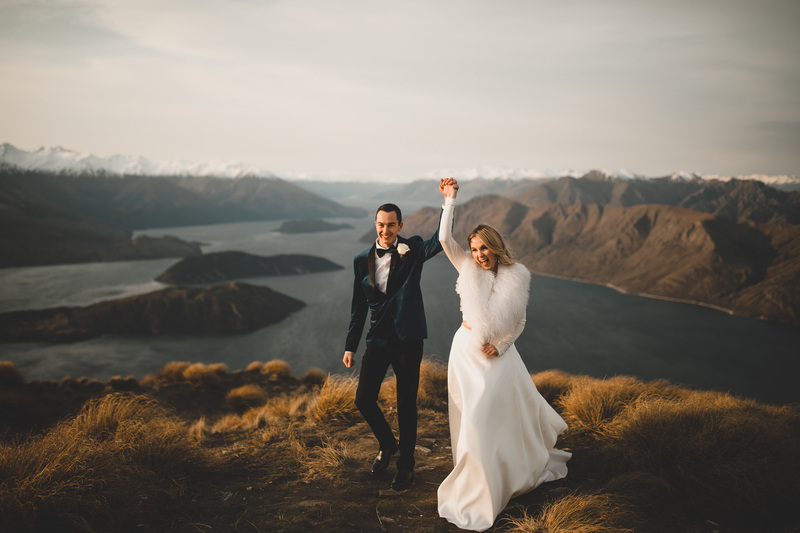 We brought two friends with us on our elopement – they were the only people who knew we were even getting married! My friend and I went horseback riding around Wanaka’s rolling hills and through a vineyard – it was my absolute dream morning! We then met up with the boys after their morning of clay-shooting and playing golf and enjoyed lunch by the lake and spent the rest of the afternoon exploring Wanaka. Is there any advice or words of wisdom you have for future brides? A wedding doesn’t have to stick to tradition; it’s about you and your future husband and the life you plan to spend together. Make the day exactly how you want it to be, don’t feel like you have to make it for other people. The best thing we ever did was to elope! Wedding planner/Photographer: Warren, owner at Mountain Weddings. He is now a mate! 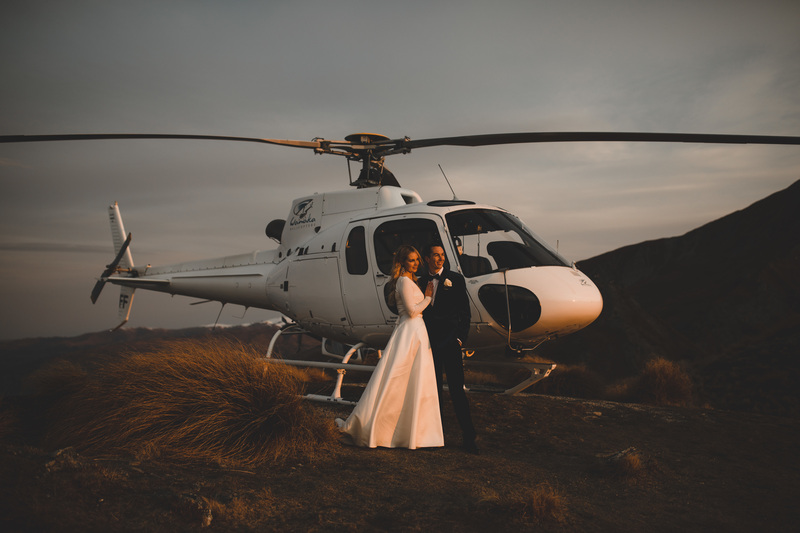 ; Location: Coromandel Peak, Wanaka, New Zealand; Helicopters: Wanaka Helicopters; Flowers: Wanaka Wedding Flowers; Makeup: Phillippa from Eve Makeup Artistry; Cowboy boots: Old Gringo Boots from Allens Boots in Austin, Texas (I had them flown to Australia – it was always my dream to get married in blue cowboy boots); My wedding band: Natalie Marie Jewellery; Andrew’s wedding band: Michael Hill; Andrew’s suit: Politix; My earrings: Mimco.